This heavenly tasting, crunchy, munchy snack is called Thenkuzal. It is paler in color compared to murukku, eaten with afternoon tea or coffee. Simple to prepare and is perfect for every occasion. 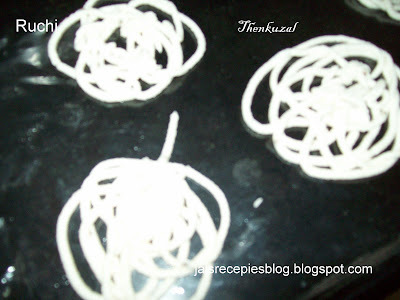 My husband like thenkuzal very much for him I used to prepare often. It took me less than a hour to make them. I would have gone with a freshly milled Rice flour and urad flour and thenkuzal were great..
2. Add Jeera, asafoetida powder, salt and butter and mix it all into a thigh dough consistency. 4. Heat oil in a small wok / deep frying pan.When fumes fumes rising Put thenkuzal template in oil one by one.Fry till they turn attain a slight golden tinge. You don't have to fry them till they turn golden brown as murukku. Remove them with a slotted spoon and drain them . 5.Repeat the same process with the remaining dough and fry them in batches. Frying thenkuzal takes very less time, if you do it on a medium flame. Have a yummy thenkuzal for coffee/tea. ur new template is too cool! Thank you Deesha & Srilekha for quick response. oooh, looks so mouth-watering. My fav. snack! Hey Jaishree, the thenkuzhal looks perfect... and new profile pic too! Looking pretty. can we use ready-made flour or we have to grind them? looks so nice. ThankYou Uma,Purva, Anu divya, gita, Ramya, Uj for loving comments. Sharmi thank you for your sweet comments. I always use fresh Grinded flour. oh looks perfect & crispy.. sounds delicious..
After the gr8 parade of sweets here following the savories... Hm.. looks delicious. check out my blog for the EFM Sweet series - Round Up! Malar,Thank u for your concern &vfor loveing comments. Hema thak u sooooooomuch for sweet compliments. Thanku Srilekha for adding me in wonderful roundup. Your thenkuzhal is really superb dear. I used to get it in a more brown color. Lovely recipe. I love all South Indian savories, and thenkuzhal is one such! Wish I could have a crack at it now! Your murukkus have come out well. 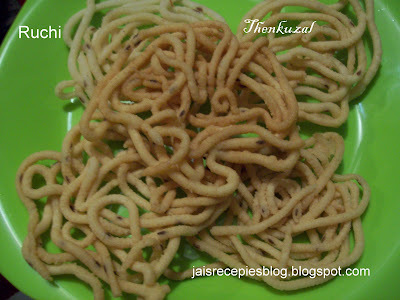 I did plain murukku yesterday for xmas with exactly or almost the same measurements as you. Thank you very much for the comment.